Fun in the snow at Big SKy! My wife and I had a great ski vacation at Big Sky. The condo was perfect for our weekend. A fantastic view of the mountain. The staff at Stay Montana is excellent. Arranging the rental, working with the staff has been very agreeable. I was coming from overseas and my various pieces of gear was shipped to the office in advance, along with a bunch of other supplies I would be needing. The staff was extremely helpful in permitting this and David Moore has been especially wonderful in bringing the numerous items over to the condo, since I did not have a car to go pick them up. He has been a pleasure to work with on everything getting me situated here and that goes a long way to making me feel at home and comfortable. Thanks! My first time to Big Sky and I couldn't be more delighted with the mountain or the condo I rented at Cedar Creek. It is simple but very well equipped (kitchen, laundry, wifi, etc) and comfortable (beds, linens, towels, etc.). It is also extremely quiet, not a sound from any neighbors adjacent or below, very important to me. The shower is hot and the heating system is consistent. So convenient to walk the equivalent of a block to hop on the trolley to the base, and fully ski out from mid mountain to just across the street. There are no community amenities here, but I came to ski. I hope to return every year. Well appointed and cozy condo! Our unit was really nice and extremely well equipped. The kitchen had everything we needed to cook and then some. The beds were really comfortable. The concierge Wes very helpful with questions. I will definitely come again and recommend Skycrest to my friends! Zach was very helpful with the registration, directions and anything else we needed. He was very attentive. Thank you, Zach. 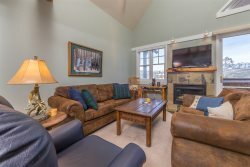 This Hyalite Gem is meticulously clean, comfortable and a home away from home! Both bedrooms are spacious, have beautiful views of the mountains and the beds were very comfortable. The kitchen had everything we needed! Lot's of pot and pan options and crock pot. The kitchen was very clean as well as the bathrooms. The towels are plush and other amenities you would find in a hotel. It snowed 2 days and the roads were always plowed for us. The location of this place is close to Hyalite Canyon so we took full advantage of this and went snowshoeing. Spectacular views and great snow! It's 15 minutes to town, very close to grocery stores, gas, and the downtown area. We will be back for sure and it really felt like a home away from home. We have stayed in this property for the past five years and love it! Top class, excellent view and interior finish. The best possible for the price.